It's Going To Be A Warm Weekend . . . So if you're dog is going to be participating in activities this weekend and upcoming weekends, it is time to stock up on K9 Go Dog! Every dog benefits from K9 Go Dog in warm weather. 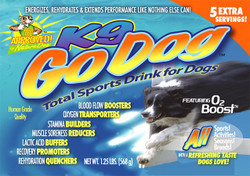 K9 Go Dog will helps increase blood circulation which means improved oxygen and energy delivery, recovery and helps keep your dog hydrated. We use this product just about every weekend during the summer with our dogs when they are working the booth during warm weather.